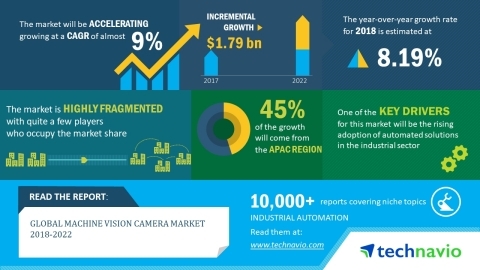 The global machine vision camera market research report by Technavio predicts the market to post a CAGR of close to 9% during the period 2018-2022. A key driver for the global machine vision camera market is the increasing focus on quality inspection in the manufacturing process. The industries across the globe have been concentrating on improving their production efficiency, operational excellence, and competitive advantage and hence, are upgrading their manufacturing operations. The companies are adopting automated equipment and systems to reduce costs, deliver improvements in safety by reducing human interaction, and improve the production throughput. This global machine vision camera market research report also provides an analysis of the most important trends expected to impact the market outlook during the period 2018-2022. Technavio classifies an emerging trend as a major factor that has the potential to significantly impact the market and contribute to its growth or decline. IoT includes connected devices, which are equipped with software and hardware that allow data to be sent or received through communication protocols. To send data to cloud computing servers, these devices may use other devices or hardware such as smartphones as their gateway to the Internet. The data received by the servers is then aggregated and analyzed. This data and the results can be accessed through industrial computers. "IoT enables the machine vision camera to provide real-time connectivity with the user, eliminates waste through optimization, enhances flexibility, increases the return on investment, and reduces the time-to-market and inventories. The use of IoT in machine vision cameras will ensure high cost savings and improved efficiency of the overall manufacturing operations," says a senior research analyst at Technavio. This machine vision camera market analysis report segments the market by product (3D cameras, line scan cameras, and area scan cameras), end-user (industrial and non-industrial), and geography (the Americas, APAC, and EMEA). The 3D cameras segment held the largest machine vision camera market share in 2017, accounting for more than 38% of the market. This product segment is expected to dominate the global market throughout the forecast period. The APAC region led the market in 2017 with more than 39% of the market share, followed by EMEA and the Americas respectively. The APAC region is expected to dominate the market throughout the period 2018-2022.